The academic paper, co-authored by Hedenstierna-Jonson, which the article refers to, can be found here, and gives additional information. Firstly, about the context in which the grave was excavated. 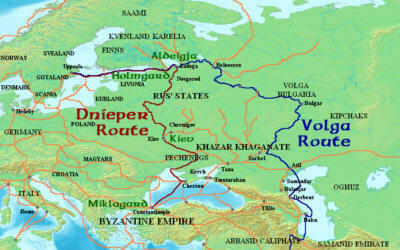 During the 8th to late 10th century, Birka was a key trading centre, linked to social, cultural and economic networks reaching beyond the Ural Mountains via the Dnieper and Volga rivers. This aspect of Viking trade is less known outside of Russia than the Viking’s expansion to the West – their colonisation of Greenland and possibly America, the Danelaw in the British Isle. But part of it is the Viking share in the Roman Varangian Guard, based in Constantinople. The paper states that during the time of the burial, Birka is estimated to have had a population of 700-1000 inhabitants, consisting of trading families, artisans and warriors. Therefore, its (urban) culture was different from everyday life and practices in the surrounding region. This reflects cultural influences from both the Islamic and Eastern-Roman world, with which Birka was in contact, and had its consequences for the way people were buried. The area harbours over 3000 graves, of which around 1100 have been excavated, making it “one of the largest known congregations of burials in the Viking world.” Distributed over a large area, the burial grounds encircle the town area. Illustration by Evald Hansen based on the original plan of grave Bj 581: Stolpe, H. (1889). Ett och annat på Björkö. Ny Illustrerad Tidning, 25, 4–16. Strontium isotope analyses leads the paper’s authors to conclude that ‘female warrior’ was not local, but had moved to Birka. The DNA-evidence supports the findings of the osteological research, which found that the individual was probably female, with dental wear suggesting she was older than thirty. Interestingly though, for someone described as a warrior, no pathological or traumatic injuries were observed. It is its discussion of this lack of trauma that is the paper’s greatest let-down. This reasoning is disingenuous. Accepting that repeated trauma, especially if some of it has healed, is an indication of the skeleton individual having been a warrior, the ‘female warrior’ having such trauma would have been good proof of her being so. Of course, the fact that such trauma is absent does not necessarily mean that she wasn’t a warrior. But a low frequency of trauma in other burials, even if they were male, is only relevant in this case, if those males were warriors. But the paper doesn’t explicitly mention this.